Most workers at the local store asked shoppers to consider using another store, standing with strike signs to the side of the doors to the store. Some 31,000 unionized grocery store employees were included in the strike, with many from the local store being Everett and Chelsea residents. Long time Stop & Shop employee Mike Bruce strikes outside of his workplace in Everett. The main contention of the demands by workers includes a fair wage, affordable/accessible health care and a reliable retirement plan. The United Food and Commercial Workers International Union said on Tuesday afternoon that they are still negotiating with the company but might have some news by the end of the week. The struggle began earlier this year when the union contract was about to expire in February, with the Union threatening a strike. On Feb. 23, the contract did expire, and the Union authorized a strike. The union local representing Everett’s store is UFCW 1445. While federal mediation was taking place in the time from that strike authorization to now, talks did break down recently – prompting the strike action. Local officials made visits to the front lines over the weekend. State Sen. Sal DiDomenico said Stop & Shop, and its parent company Royal Ahold, should treat the workers with dignity and respect. Stop & Shop officials said that negotiations are continuing with the UFCW union locals, again with the support of federal mediators. The company has said they have been very generous in their contract offer to the UFCW union. On health care, they indicated they have agreed to pay 92 percent of heath premiums for family coverage and 88 percent for individuals. Th company said that is much more than other large retailers – citing that the federal government pays 72 percent and other employers average between 70 and 80 percent. Additionally, the offer includes no changes to the deductibles, and small increases to co-pays. The company said it is also offering a defined benefit pension plan that pays between $1,926 and $2,644 annually per associate. In the new contract, the company said it has agreed to increase contributions to pension funds. Also, they added that the paid time off has not changed and continues to be 10 to 12 paid holidays per year. Gov. Charlie Baker brought a short smile to the face of many when he unveiled an increase in education funding in his State Budget proposal two weeks ago, but this week Supt. Mary Bourque said the proposal needs to go further for cities like Chelsea. “Although a step in the right direction for public education and in particular gateway cities, the Governor’s FY20 budget does not go nearly far enough,” she wrote in a letter on Feb. 6. Bourque said the Chelsea Public Schools are facing another year where they will likely – as it stands now – have to cut another $2 million from their budget. That falls upon multiple years of cuts that have weighed cumulatively on the schools and taken away core services from students. One of the problems is that salaries, health insurance and special education costs are rising so quickly. This year, she said, they are looking at increases in those areas of $5.2 million. Gov. Baker’s budget proposal steers an increase of $3.2 million to Chelsea over last year, but in the face of rising costs, that still leaves the schools in the red. It’s yet another year of advocacy for the schools to fix the Foundation Formula – an exercise that has seemingly played out without any success for at least five years. Bourque also spelled out the complex nature of the Chelsea Schools, including numerous factors that are contributing to the reduction in funding. One of the most startling situations is that there are fewer kids, and with education funding based on numbers of kids, that translates to even less money for the schools. Bourque said this year they have begun to identify a downward trend in enrollment for the first time in years. She said fewer kids are coming in from outside the U.S. and families are leaving Chelsea for areas with lower rents and costs of living. “In addition to the foundation formula undercounting critical costs, a significant portion of this year’s $2 million dollar gap is due to student demographic shifts taking place in our schools,” she wrote. “We are seeing a downward trend in student enrollment…This year we have noted fewer students entering our schools from outside the United States as well as a number of students and families moving from Chelsea due to the high cost of living in the Boston area.” The Chelsea Public Schools under the City Charter have until April 1 to submit their balanced budget. Bourque said they plan to lobby members of the House of Representatives and the Senate in the meantime to fix the funding gaps that now exist. 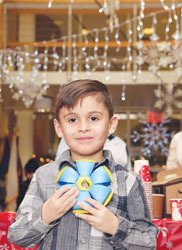 Justin Machado holding his new Phlat Ball after his special visit with Santa at the Chelsea Police Station on Tuesday, Dec. 18. The annual pre-Christmas visit to Santa has become a staple for local children, with the Police partnering with the Early Learning Center (ELC) this year. Jose Gutierrez wears many hats in his family and on the Chelsea High basketball team as well, but this week, he is wearing the captain’s hat and has taken one step in leading an experienced hoops team to a good year. Chelsea kicked off its season on Tuesday against Essex Aggie and cruised to an easy victory behind the defensive effort and leadership of Gutierrez. The Record sat down with Gutierrez on Monday afternoon, and the two-time captain and senior said they have a scrappy team this year. The team returns seven seniors for second-year Coach Judah Jackson, and Gutierrez said they have learned from their playoff loss last year against Waltham. Gutierrez, 18, grew up in Chelsea and went to the Kelly School and the Wright Middle School before landing at Chelsea High. He also played in the Chelsea Youth Basketball League (CYBL) and said it made him more of a team player. Same could be said for his academic IQ as well. Gutierrez busies himself taking a rigorous college preparatory schedule and is enrolled in the Bunker Hill Community College program that allows students to take college classes in high school. Becoming an EMT is very personal for Gutierrez, who said two years ago he and his family watched helplessly as his father had a heart attack in their home. When the paramedics arrived, he said he was impressed with their skill and how they were able to care for his dad. Gutierrez also runs track and plays soccer too, having been on this fall’s outstanding Chelsea High soccer team that went undefeated in the regular season. However, Gutierrez also has to work as a janitor at a local radio station, where his parents supervise him. He is also responsible for watching his 9-year-old sister, who has become the team mascot and honorary water girl. He said every time he hits the practice floor or suits up for a game, he has to thank his parents, Rafael and Nolbia. He said it’s because of them that he even gets to still play sports. Gutierrez and the Red Devils will host Greater Lowell at 5 p.m. on Friday, Dec. 14, in the gym. 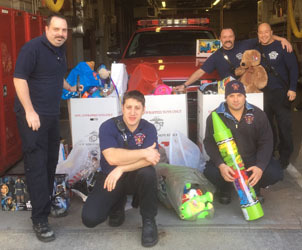 The Chelsea Fire Department has embarked on another year of collecting toys at the Central Fire Station for needy families, delivering them mid-month to the Toys for Tots campaign. Capt. Phil Rogers said the fifth year of collections at the Central Fire Station has begun and he urged everyone in the community to bring in a new, non-violent, unwrapped toy if at all possible. They are accepting donations through Dec. 14, and can take them at the Station in Fay Square between 8 a.m. and 8 p.m. every day. This year, the Fire Department is also sponsoring a winter clothing drive in conjunction with the toy drive to benefit St. Luke’s Food Pantry. In response, the Department decided to begin collecting winter clothing. He said they need new or lightly-used gloves, hats, coats, mittens or scarves. For the homeless, he said they are requesting new packages of wool socks. The Department will continue collecting the winter clothing through December. Anyone in need of toys from the Toys for Tots campaign should contact their social worker or pastor, who will put them in touch with the proper people. The cost of a traditional Thanksgiving meal has once-again decreased and is at its lowest cost since 2010, according to the 33rd annual American Farm Bureau Federation’s (AFBF) Thanksgiving dinner survey. The AFBF reported late last week that it had found the average cost of a traditional Thanksgiving meal for 10 to be at $48.90 nationwide, which figures to be less than $5 per person. It was a 22-cent decrease from last year’s low of $49.12. This year’s new low has put the cost of the traditional meal at the lowest cost since 2010. The chief driver of the lowering costs is the most common item – the turkey. AFBF research showed that retail turkey prices are at the lowest costs since 2014, mostly because they are in abundant supply. The average cost for a 16-pound turkey this year is $21.71, which is down 3 percent per pound from last year. Some items did show an increase, however, including Massachusetts’ own contribution to the Thanksgiving table – the cranberry. Other items on the increase included pumpkin pie mix and cubed bread, among other things. one-pound veggie tray was $.75. A group of miscellaneous items including coffee and ingredients necessary to prepare the meal (butter, evaporated milk, onions, eggs, sugar and flour) was also up slightly, to $3.01. To provide information on the increasingly changing Thanksgiving meal, AFBF looked in at hams and other new additions. Adding a four-pound bone-in ham, five pounds of Russet potatoes, and one pound of frozen green beans added about $1 per person to the overall cost. AFBF also surveyed the price of a traditional Thanksgiving meal available from popular food delivery services. This revealed that the convenience of food delivery does have a larger price tag. A 16-pound turkey was nearly 50 percent more expensive at nearly $2 per pound when purchased from a food delivery service. Nearly every individual item was more expensive compared to the do-it-yourself average and the total cost of the dinner was about 60 percent higher at about $8 per person. The AFBF Thanksgiving dinner survey was first conducted in 1986, and the menu has not changed since that time for reliable comparison year to year. While AFBF does not make any scientific claims about the data, it is an informal gauge of price trends around the nation. City Manager Tom Ambrosino told the City Council he believes it might be time to start a discussion about charging everyone a trash fee in the coming years as costs continue to rise for rubbish collection and recycling. This came at the same time that he announced water and sewer rates would increase by 7.95 percent this year and the existing trash fee would climb 10 percent over last year. Currently, trash fees are only charged to properties that are not owner-occupied. However, Ambrosino said it might be time to change all that. The trash rate will increase to $30.09 monthly for residential property and $141.96 monthly for commercial units in mixed buildings. Meanwhile, for water and sewer rates – which affect every homeowner – the combined rate increase will be 7.95 percent over last year. The average water user can assume a bill of $1,776 annual for water and sewer charges. The water rate alone will go up 6 percent, and the sewer rate alone will go up 9 percent. Together, they arrive at the combined rate increase of 7.95 percent for residential users. For Tier 1 users, the combined rate is $14.80 per hundred cubic feet. The rates went into effect on July 1, but a Monday’s Council meeting Councillor Bob Bishop was quick to criticize. It was a new year at the Clark Avenue Middle School Wednesday morning, Aug. 29. But it wasn’t just any new year. It was the year that students poured through a brand new front door to the clean, sparkling hallways of a brand new $54 million school building with all of the most modern amenities that their old school – the former 110-year-old Chelsea High School – couldn’t provide. For parents, the excitement was just as frenzied. The Clark Ave began several years ago, with Phase 1 concluding in December 2016 and kids being welcomed into the new classroom portion along Tudor Street. This year, however, the entire school was opened to students – revealing a new gym, new music rooms, the library and numerous other amenities that completed the project. Supt. Mary Bourque and other district officials, including Gerry McCue – who shepherded the project through before retiring this year, were on hand to welcome students and parents. One of the most appreciated things on Wednesday morning for the students, parents and staff was the new, sprawling courtyard and outdoor amphitheatre at the corner of Tudor Street and Clark Avenue. The new space is still under construction, but was finished to the extent that it offered a great place to gather before school. Previously, the school hugged the sidewalk, and there was little to no space for gathering. The new outdoors space will support learning at the school, and will also be available for the community to use for things such as outdoor plays or movies. The Williams School – home of the Browne Middle and Wright Middle Schools – experienced a heart-attack moment on Monday afternoon when a major sewer blockage threatened opening day. Around 3 p.m. on Monday, the sewer backed up and caused a major problem in the school. All of the teachers getting prepared for the school year in the building were sent home. Joe Cooney and his team at the Buildings and Grounds Department went to work on the problem and soon found that there was a huge cluster of baby wipes clogging the sewer pipe and drains. Alex Taborta and Esther A. danced inside Pan y Cafe during Fiesta Verano last Saturday, Aug. 4. The second part of the Chelsea Art Walk had a hard time avoiding rain this year, having been cancelled once due to rain. On Saturday, organizers decided to go for broke, and moved the event inside Pan Y Café – courtesy of owner Roy Avellaneda. Several acts performed inside, and the Latin-themed afternoon was a hit. The Chelsea Public Schools have had a life-line in the State Budget the last few years as finances have gotten more difficult. That life-line is known as the ‘Hold Harmless’ provision, or more popularly the ‘Pothole’ account. This year, that account is little to no help for Chelsea as the district saw their funding slashed in half. Last year, Chelsea got an additional $1.214 million from the Pothole account funding – a fund that seeks to help districts who are not getting a proper count of their low-income students due to changes three years ago in the way they are counted. However, this year Chelsea will only get $296,000, nearly $1 million less than last year. State Sen. Sal DiDomenico said he was disappointed in the funding allotted to Chelsea for the Pothole account, and the ability not to be able to fix the funding for the long-term. That was something he had proposed in the education funding bill.